An indoor scavenger hunt that is an exciting journey of discovery through a nature museum or aquarium. Sharks! Dinosaurs! Creatures from the deep or from the distant past. All are waiting to be discovered in this fascinating nature scavenger hunt at the Georgia Aquarium or the Fernbank Museum of Natural History. More than your average indoor scavenger hunt, our amazing app-driven game will take your team through a fantastic voyage of fun and camaraderie. Welcome & Warm-Ups (5-10 minutes) Our staff welcome the participants to their adventure and get everyone ready for a great event. We then lead some fun warm-up activities that also randomly create small teams. Team Up! (5-10 minutes) Teams take a few moments to create animal-themed team names and slogans to fire up their team spirit and unity. Event intro (5 minutes) Our fun and professional staff give the group a quick tutorial on the app and the other event components to ensure a smooth start to their indoor scavenger hunt. 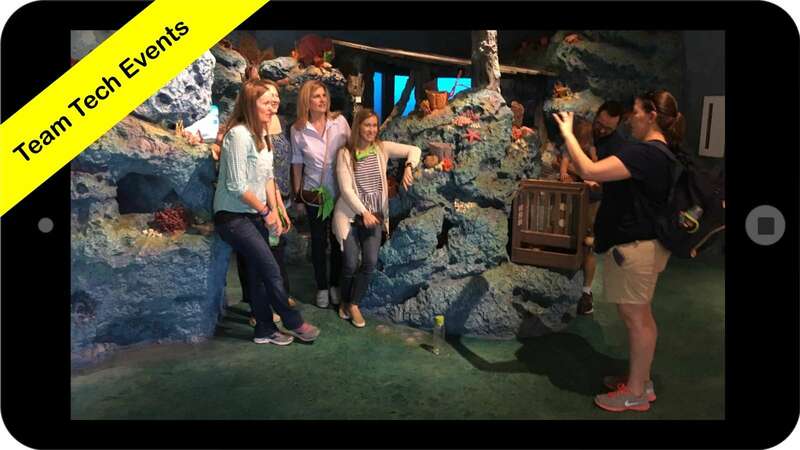 Video Missions: Teams find the perfect locations to produce mini videos such as “how to survive a dino attack,” “care and treatment of your pet shark” and other site-inspired topics. Animal encounters Find one of our facilitators as they roam around to get a team portrait with a famous wildlife celebrity. All Natural Trivia: Teams use the app on their devices to scan exhibits to access trivia hotspots. When they do, the timer starts and they have to hurry to find the answers around them before time runs out. Photo Missions: Teams attempt to be in the right place at the right time to get the perfect shot of their group. Under The Sea: Teams watch brief clips from famous movies and try to identify the movie, actor, or song in the popular movie clip. Bio-Logical: This hunt has something for everyone! The more intellectual participants will sink their teeth into this collection of animal kingdom brainteasers. Swarm Challenges: At random times, we will release bonus challenges into the game. Teams will have to race to the new location and try to complete the challenge before the competition gobbles up all the points. Wrap-Up (15 minutes) We finish by sharing memorable moments from the event and taking a great group picture. Enjoy a great Atlanta venue. Create more fun and laughs on your team. "Thank you so much for facilitating our program at Fernbank yesterday. Everyone is still talking about it."